On Saturday afternoon I gathered community around me,in a circle to honor the spirit of corn. Corn- long considered a sacred plant to native cultures that depended on it- has become a very strong ally and teacher to me in the last few years. I offered a similar ceremony a year ago, and you can read about the experience I had taking offerings to the cliffs of New Mexico. Since that time, I have continued to work with Corn, or Maize. A plant that is known in both positive and negative ways. To me, Maize, represents the mothering, nurturing energy of the Divine/Sacred. She teaches me every day about making life sacred. About how to honor body as a sacred temple. About how to welcome and create abundance for myself, and for community. Maize is truly a medicine of community- and sacred celebration in community. Maize as we know it- was essentially bred into a plant for food by humans over thousands of years. Its evolution is deeply and firmly connected with humanity, and has become something akin to us. Many cultures say we are beings made of Corn. And truly, we are, as most things in today’s world contain corn in some form or not. I bring ceremony for this plant around the time of Thanksgiving. I know there is a lot of discussion about the inappropriateness of celebrating a holiday that resulted from the massacre of many native peoples, and while I do agree on one level, it is still a favorite time of year for me. To gather with community, family, and share deep gratitude for our lives, and honoring the many gifts we have been given, and finding ways to heal, transform and change the pieces and stories of our culture that are dishonoring to humanity, the Earth, and Spirit. Truly- the spirit of Maize asks us, to bring the celebration of abundance and gratitude back into a SACRED light. How can we honor the Sacred in the mundane aspects of our lives? How is there sacredness in sharing our food, how is there sacredness in tending our home/hearth, how can there be sacredness in the act of caring for our body through HOW and WHAT we eat, how we move, how we take rest. This is all sacred. So, in ceremony we gathered. We placed offerings to the Spirit of Corn on the altar- again, which I will carry to a wild place on the land to offer the Earth in gratitude for the abundance we are given each and every day. We each shared our story and connection with corn- for such a misunderstood plant in our culture, we all beautiful ways and memories of corn being a sacred and beautiful thing to us. We created a despacho- an offering mandala – made of corn of many colors, seeds, beans, corn meal, corn husks, and cacao. In humble ceremony with a dear sister, the despacho was burned under the light of the stars. We offered more gratitude. For who would we be, as a people, as humanity, without corn? Really when you think about it, our lives really revolve around corn. In many ways that are not serving or healthy, and some ways that are. But the biggest gift and lesson that Corn has shared with me about the state of the situation this plant is in today, is that by being spread across the globe, important now as a staple to cultures all over the world , it is primarily through this disharmony and misuse of corn- that the people of the world can unite together, in the name of healthy, whole, and sacred food. Corn will unite us in a way that can change the way the world sees, produces and shares food. At one point this year, there was some conversation about weather or not my work with corn fell into the realm of inappropriate cultural appropriation. I mean no dishonor to any culture, nor do I claim to know the sacred workings, ceremonies and rites of cultures that used corn. I connect deeply with this spirit, because of the land I live on in the southwest, because I am a plant person, and a food person, but most importantly because this plant spoke to me, through the ways of spirit. No person, culture or country can claim spirit- it is a universal human experience. I am only interested in honoring and healing and serving this plant from a place that comes from what is genuine in my heart and my personal experience, not taking from someone else. The Gifts and lessons this plant has offered me are many and deep, and I feel deeply humbled and honored that this ancient, wise and sacred plant saw fit to ask me to work with it in this way. Everything that comes through me in my work with corn is coming from this place of connection with the spirit and the sacred that all humans can touch and understand. 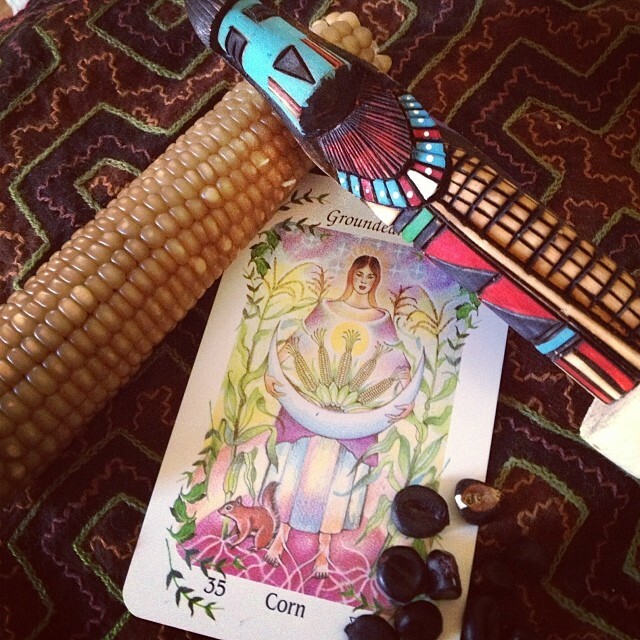 I want to bring sacredness and magic and honoring our land, our bodies, our spirits back into our culture…and corn is a medicine and a teacher for this. Simply beautiful! You have given me a new appreciation for the humble, yet powerful corn. Thank you. Forget the “culture police” and forget the “bible thumpers.” Just keep doing what you are doing, Darcey. Many Blessing…. Why are you worshiping plants? God who created the plants and everything else,is the only one humans should worship. The bible says that in the last days just before Christ returns to earth.That people will do exactly what your doing.Worshiping the creation,instead of the creator. A plant is a created thing that God made for the benefit all life on this planet. But its the one who made it not the thing itsself that is worthy of our praise and worship.